Not much to report today. We have a snow day tomorrow as the Metroplex is being covered in ice right now, with little sign of stopping. 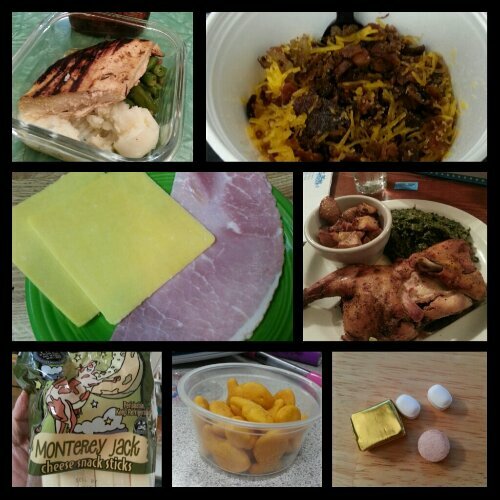 Today’s food choices, from upper right: Rudy’s egg, bacon, bean and cheese breakfast bowl; leftover roasted chicken, creamed spinach and roasted potatoes; multivitamin and calcium supplements x2, iron supplement; Goldfish crackers; Trader Joe’s Monterey jack cheese stick; Boar’s Head sweet slice ham and Tillamook cheddar cheese; grilled chicken breast, green beans and Trader Joe’s mashed potatoes. This entry was posted in daily bites, eating, post-op, vsg, weight loss surgery and tagged daily bites, eating, post-op eating, post-op life, VSG, vsg realness. Bookmark the permalink.